In this post, we'll cover how to automate EBS snapshots for your AWS infrastructure using Lambda and CloudWatch. We'll build a solution that creates nightly snapshots for volumes attached to EC2 instances and deletes any snapshots older than 10 days. This will work across all AWS regions. Lambda offers the ability to execute "serverless" code which means that AWS will provide the run-time platform for us. It currently supports the following languages: Node.js, Java, C# and Python. We'll be using Python to write our functions in this article. We'll use a CloudWatch rule to trigger the execution of the Lambda functions based on a cron expression. In the AWS management console, we'll go to IAM > Roles > Create New Role. We name our role "ebs-snapshots-role". For Role Type, we select AWS Lambda. This will grant the Lambda service permissions to assume the role. On the next page, we won't select any of the managed policies so move on to Next Step. Go back to the Roles page and select the newly created role. Under the Permissions tab, you'll find a link to create a custom inline policy. In our code, we'll be using Boto library which is the AWS SDK for Python. The code will create snapshots for any in-use volumes across all regions. It will also add the name of the volume to the snapshot name tag so it's easier for us to identify whenever we view the list of snapshots. Next, select the role we created in the Lamba function handler and role section. The default timeout for Lambda functions is 3 seconds, which is too short for our task. Let's increase the timeout to 1 minute under Advanced Settings. This will give our function enough time to kick off the snapshot process for each volume. Click Next then Create Function in the review page to finish. Selecting CloudWatch Event - Schedule from the dropdown list allows us to configure a rule based on a schedule. It's important to note that the times listed in the cron entry are in UTC. You'll be prompted to enter a name, description, and schedule for the rule. It's important to note that the times listed for the cron expression are in UTC. In the example below, we are scheduling the Lambda function to run each weeknight at 11pm UTC. We can test our function immediately by click on the Save and Test button in the function page. This will execute the function and show the results in the console at the bottom of the page. 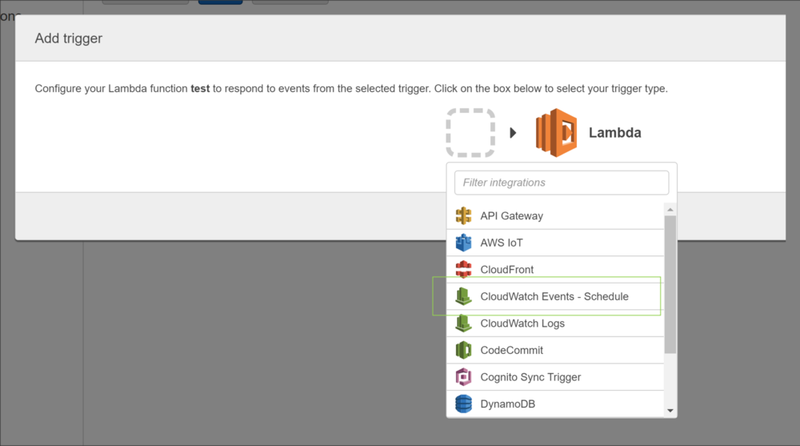 After verifying that the function runs successfully, we can take a look at the CloudWatch logs by clicking on the link shown in the Log Output section. Let's take a look at how we can delete snapshots older than the retention period which we'll say is 10 days. Before using the code below, you'll want to replace account_id with your AWS account number and adjust retention_days according to your needs. How do I include or exclude certain volumes from the create snapshots function? 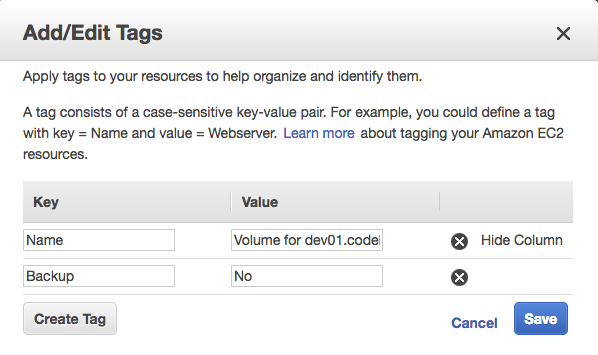 We can also create tags on volumes and filter by tag. Suppose we wanted to backup only the volumes that had a specific tag named "Backup" with a value of "Yes". Excluding certain volumes using tags is a bit different. The Filters parameter of describe_volumes is for inclusion only. So we cannot use that to tell the script to exclude specific volumes. Suppose we wanted to backup all volumes EXCEPT ones with a tag named "Backup" with a value of "No".